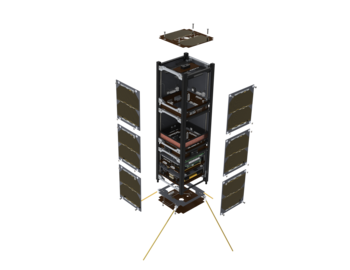 Our 3U standard platform is based on the flight proven GomSpace platform used on the GOMX-3 mission launched in 2015 from the ISS and used on several commercial radio missions for customers since. The 3U size has a unique combination of large payload volume available, small platform mass, precise ADCS system with dedicated ADCS computer and sufficient power system to maintain full duty cycle for a commercial radio payload. Save development cost by using the GomSpace predesigned Standard 3U platform for you mission. Just add payload and payload communication system. Power system with 6 latch-up protected outputs, Battery Pack, Solar Panel son all faces. Communication system with On-Board Computer, UHF radio and antenna, Flight Preparation Panel for testing and checkout and Interstage panels. ADCS software for fine pointing and preinstalled example code configured for system diagnostics. Dedicated ADCS computer, GPS Module, 1 reaction wheel for 1-axis control, 6 fine sun sensors and magnetometer. For a standard platform delivery without payload integration, lead time is 4-6 months from reciept of order.